Neil Warnock has been ruled out of the running for the manager's job at Sheffield Wednesday. They have been looking for a new boss since sacking Dave Jones on Sunday. Owls chairman Milan Mandaric had confirmed on Wednesday that the former Sheffield United and Leeds boss was in contention for the post. "I didn't realise just how much the fans were against the idea, it was best that we didn't do it," Mandaric told BBC Radio Sheffield. "I didn't make a firm offer to Neil but he showed great desire for the job. He's a good manager but I didn't want to hurt fans' feelings. "I still have people to talk to and that will happen next week but I don't want to rush things." The Serb confirmed that caretaker Stuart Gray, who won his first match against Leicester on Tuesday, is on the shortlist for the position. Warnock said he was aware that taking over at Hillsborough would have been a controversial appointment. "Milan spoke to me and I knew he wanted to bring someone in to keep them up really," he said. "I did say to him that it was pretty much impossible for a Blade to manage the Owls and I think he's had a bit of a think since then about the rivalry in the city. "I genuinely thought that when I looked at the other managers in contention that I had the best chance of keeping them up. "They've got to get their mind on Forest on Saturday now and it was important to put this to bed." 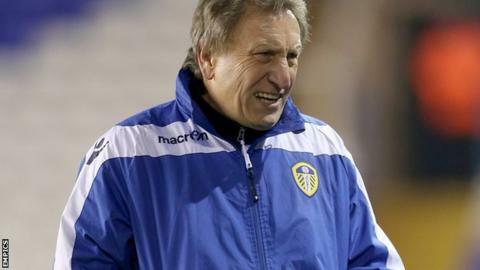 It is well known that Warnock is a supporter of United, who he led to the Premier League in 2006, a feat he repeated with Queens Park Rangers in 2011. When asked in 2002 what he would do if he ever managed Wednesday, he said: "I would buy some bad players, get the sack and then retire to Cornwall." But in 2010, he said he would consider taking over at Hillsborough. The Owls are currently three points away from safety in the Championship.